Burgundy multiway dress in chiffon, perfect for dressing bridesmaids or to wear to formal events. Choose from a range of 16 fashion styles such as backless, strapless, halter neck and cap sleeves. 2 long panels of fabric are attached to the skirt at waist, giving you the freedom to style the top part in whichever way you can imagine. Get creative or let our how to tie guide inspire you. 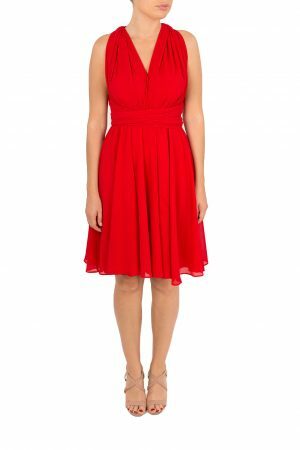 Get more use out of this dress, by styling it differently for the next event. Get 16 dresses for the price of 1! This is also available as a maxi dress.